We’re all familiar with the typical guitar setting: volume at 10, crank the amp and distortion and go. But, there are 9 other numbers on the guitar’s volume knob. Many often ignore 1-9? There are a lot of sweet spots bellow 10 that can help expand any guitar player’s arsenal of sounds. Many guitarists, myself included, have been guilty of chasing various tones over the years, often relying on guitar pedals to fill the void. One pedal for a little dirt, one for a little more dirt, one for uber dirt, two stacked for fatness, etc. But, a lot of these in between tones can be found with the often ignored volume knob. Once you have a great tone foundation with just your guitar and amp, and maybe a little reverb, you’re all set to start exploring the vast tonal goodness of rolling back the volume. One of the sweetest tones in my opinion is finger picking an over-driven guitar with the volume set around 5-7. Add a little reverb and a delay, and angels will start singing. Jeff Beck is a master of that tone. He has always been a wizard at utilizing the volume knob to summon the Gods. A lot of his most beautiful pieces are in that sweet spot, the creamy, buttery, voice-like tone that he has perfected over decades of playing. Of course, finger-picking adds a lot of fatness to his tone. But, the volume knob gives him a lot of versatility and dynamics. When it’s a softer or bluesier part of the song, he can turn down the volume a bit and get just enough dirt to fatten the tone but make it sound so clean and pretty. Then, when the song picks up or he just wants to get more explosive, he rolls the knob to 10. I’d like to challenge guitar players to reduce their reliance on overdrive pedals for all the tones they’re chasing. Instead, get a good distorted base tone and try to use the volume pedal for all the in between stages. 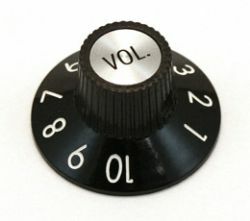 Even for songs that go from really clean to really dirty, the volume know can be a powerful transition tool.